WASHINGTON — The Smithsonian Asian Pacific American Center is hosting a special forum on the life and legacy of the late Sen. Daniel K. Inouye (1924-2012) in the Rasmuson Theater at the Smithsonian’s National Museum of the American Indian on Saturday, Feb. 23, from 1:30 to 3 p.m. Doors will open at 1:30 p.m. with a performance by the Washington-based performers Aloha Boys, and the program will begin at 2 p.m. It is free and open to the public. 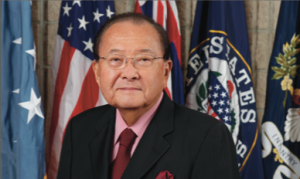 Inouye was a highly decorated World War II combat veteran, an eight-term U.S. senator and the president pro tempore of the U.S. Senate from 2010 until his death last December. He was the most powerful Asian American politician in U.S. history. Forum participants include retired Army Gen. Antonio Taguba; Tuyet Duong, senior advisor at the White House Initiative on Asian Americans and Pacific Islanders; and Terry Shima, 442nd Regimental Combat Team veteran. They will discuss the life of Inouye and his legacy. The discussion will be moderated by Kathy Park, ABC 7 and News Channel 8 news anchor. “The foundation takes time during each February’s presentation of a Day of Remembrance to commemorate the signing of Executive Order 9066, the instrument that denied Japanese Americans their constitutional freedoms and led to their incarceration throughout the United States during World War II,” said Dan Matthews, chairman of the National Japanese American Memorial Foundation and lead sponsor for the program. Additional support was provided by the Japanese American Citizens League, the Japanese American Veterans Association, and the University of Maryland College Park Asian American Studies Program. The National Japanese American Memorial Foundation is a nonprofit organization dedicated to education and public awareness about the Japanese American experience during World War II. NJAMF raised the private funds to build the Japanese American Memorial to Patriotism during World War II. The memorial is not only a monument to the Japanese American experience, but also a reminder that people must not allow anything like this to happen to any minority community again. For more information about the foundation, visit http://njamf.com/. Established in 1997, the Smithsonian Asian Pacific American Center produces programs and exhibitions about the Asian Pacific American experience and works in partnership with organizations across the Smithsonian and beyond to enrich collections and activities about the Asian Pacific American experience. The center shares the challenges and stories of America’s fastest-growing communities. It connects treasures and scholars with the public, celebrates long-lived traditions and explores contemporary expressions. These stories are vital to a deeper understanding of the nation and a richer appreciation of Asian Pacific cultures.